Haltwhistle is a small town and civil parish in Northumberland, England, 10 miles (16 km) east of Brampton, near Hadrian's Wall. It had a population of 3,811 at the 2011 Census. The name Haltwhistle has nothing to do with a railway stop. Early forms of the name are Hautwesel (1240), Hautwysel (1254), Hawtewysill (1279), Hautwysell (1381), Haltwesell (Speede 1610). The second part -twistle relates to two streams or rivers. It derives from two Old English words twicce or twise, 'twice', 'division into two' and wella, 'stream, brook'. The second word is reduced in the compound word to ull, making twicculla, twisella. All but one of the examples in place names represent a high tongue of land between two streams where they join. The first part is probably derived from Old English hēafod, here 'hill-top', in general, 'head', 'headland', 'summit', 'upper end' or 'source of a stream'. If so, it describes the hill-top on which Holy Cross Church and the oldest part of Haltwhistle was built, enclosed on the north-east and west by Haltwhistle Burn and on the south by the South Tyne. Rowland suggests Hal from 'hill' An suggestion is French haut-, meaning 'high', since the settlement already existed long before the Norman Conquest. Haltwhistle was probably in existence in Roman times, as it is one of the closest approaches of the River South Tyne in its upland reaches to Hadrian's Wall. The old Roman road or Stanegate passes just two miles to the north of the town. The development of the town stemmed from its position on the main Newcastle to Carlisle road and on the Newcastle and Carlisle Railway line. The expansion of Haltwhistle in the 18th and 19th centuries was due to coal mining in the area and to a lesser extent the use of Haltwhistle as a loading point for metal ores coming from the mines on Alston Moor. In 1836 while some workmen were quarrying stone for the Directors of the Newcastle and Carlisle Railway, on the top of Barcombe, a high hill in the township of Thorngrafton and Parish of Haltwhistle, one of them found a copper vessel containing 63 coins, 3 of them gold and 60 copper. The gold coins were, one of Claudius Caesar, reverse Nero Claudius Drusus Germanicus; one of Nero and one of Vespasian. The find is known as the Thorngrafton Hoard and the empty arm-purse can still be seen in the museum at Chesters Fort. 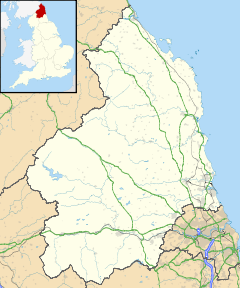 Haltwhistle lies within the now unitary Northumberland County Council and was up until April 2009 part of Tynedale district. It maintains an active Town Council which has succeeded in making a number of local improvements including the establishment in 1975 of a heated outdoor swimming pool complex which is very popular during the summer months. It is believed that Haltwhistle may be one of the smallest towns to have made such a provision in Great Britain. An electoral ward with the same name still exists. This ward stretches from Hexham south up the R. South Tyne and has a total population taken at the 2011 Census of 4,832. The town is in the parliamentary constituency of Hexham. Haltwhistle was a market town for the exchange of local goods. In the 18th century two Quakers set up a baize manufactury and there was a weaving establishment. On the Haltwhistle Burn were fulling mills, dyeing and spinning mills. A walk along this stream to the Roman Wall, shows that it must have been a hive of industry with quarries, coal mining and lime burning kilns. The Directory of 1822 (Pigot) gives a whole range of craftsmen, shopkeepers and traders—60 in number, including makers of clogs. The weekly market was held on Thursdays and there were fairs on 14 May and 22 November for cattle and sheep. The remains of Haltwhistle Castle and the series of Bastles, and Haltwhistle Tower. Haltwhistle also claims to be at the geographic centre of Britain – equidistant from the sea as measured along the principal points of the compass. A hotel in the centre of Haltwhistle is named the Centre of Britain Hotel in recognition of this claim. The claim is rather tenuous as it requires that the northern extremity is taken to be Orkney rather than Shetland. Depending on how the centre of the island is calculated, however, the centre can be said to be Dunsop Bridge in Lancashire. See centre points of the United Kingdom. There are many historic properties nearby, including Featherstone Castle, Blenkinsop Castle, Unthank Hall, Bellister Castle, Coanwood Friends Meeting House, and Thirlwall Castle. Haltwhistle Viaduct lies to the south of the railway station and was the first major feature on the Alston Line to Alston, Cumbria. The town is served by Haltwhistle railway station on the Newcastle and Carlisle Railway, also known as the Tyne Valley Line. The line was opened in 1838, and links the city of Newcastle upon Tyne in Tyne and Wear with Carlisle in Cumbria. The line follows the course of the River Tyne through Northumberland. Passenger services on the Tyne Valley Line are operated by Northern and Abellio ScotRail. The line is also heavily used for freight. The railway station is on the south side of the town close by the River South Tyne. Until 1976 the railway station was also the northern terminus of the branch line to Alston, in Cumbria, the line was thirteen miles in length. Part of the southern end of the Haltwhistle to Alston line has been reopened as a two-foot narrow gauge railway, known as the South Tynedale Railway, between Alston and Slaggyford. The trust that owns and operates the railway intends to reopen the entire branch line from Alston to Haltwhistle. The Church of the Holy Cross is situated below the Market Place, with views over the river and the valley. It is a good example of a North Country church, impressive considering the time when it was built in the thirteenth century. The chancel measures 46 by 20 feet (14.0 by 6.1 m), with lancet windows – combined three lights in the east end and four single lights on each side, the walls being supported by buttresses. Inside is a piscina (for washing) and three sedilia (seats for the clergy). There are a number of medieval grave covers to Blenkinsopps and Thirlwells. The nave measures 63 by 46 feet (19 by 14 m) and has side aisles above which are clerestory windows. It has four bays with round columns and pointed arches, looking very spacious inside. The font, dated 1676, has some curious crude carvings on it, and there is another large circular bowl on a shaft, which is probably an earlier font. At the west end it has long lancet windows and a bell-cote, again typical of the North country. Nearby, the village of Coanwood houses a small but historic chapel, designated as Grade II* by English Heritage. Coanwood Friends Meeting House was a Quaker place of worship and is maintained to this day as a historical site open to visitors. ^ "Parish population 2011". Retrieved 28 June 2015. ^ a b c d Rowland, T.H. (1994). Waters of Tyne (Reprint ed.). Warkworth, Northumberland, England: Sandhill Press. ISBN 0-946098-36-0. ^ Ekwall, Eilert (1960). The concise Oxford dictionary of English place-names (4th ed.). London, England: Clarendon Press. ^ "Ward population 2011". Retrieved 28 June 2015.